Allure Beach Retreat is a contemporary architecturally designed 2 bedroom beach house, with accommodation for up to 5 people. 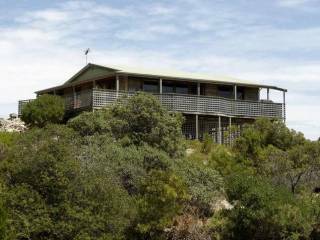 Surrounded by 50 acres of wild bushland, it is yours to explore, with winding walking tracks that meander over the rolling landscape, affording amazing views at every turn. The sound of waves gently crashing in the background will lure you. The sandy Pennington Bay beach is just a 8 minute walk through Allure's bushland. Here you can fish or surf, watch dolphins at play, or simply relax on one of the world's most beautiful beaches. Wildness with luxury... Allure will spoil your senses with large picture windows, romantic furnishings, a cosy fire in winter, and a private outdoor heated shower with incredible views. There are 2 airy bedrooms, each with a queen bed, freshly made up with beautiful linen. A sofa bed provides accommodation for another 2 guests, if wished. Indulge in the luxury of a claw-foot bath with a view, where you can watch the surf roll in, through the full-height French windows. Eco friendly comfort and environment. 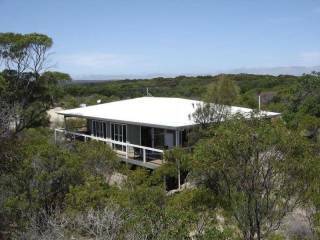 Allure has been architecturally designed to nestle into the bushland, with minimal intrusion. With solar-generated power, gas water heating and fresh rainwater collected on site, the property is a totally independent retreat from the hustle of everyday life. Yet its modern conveniences allow comfort to pervade, with cosy furniture, a stereo and a television - just in case you tire of watching the incredible views from every room. To allow you to be in seclusion if you wish, there is a fully equipped kitchen with generous crockery, serving and cooking ware. There is also a bbq on the stunning wrap-around deck, so you can cook with a view. BUT NO OVEN just A stainless steel 4 burniner including wok burner. 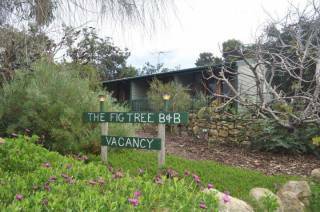 Spot an eagle nesting, watch wallabies and kangaroos at dusk from your verandah, or just relax in this amazing place. Allure Beach Retreat is not for the faint hearted. But it is for the romantic at heart. 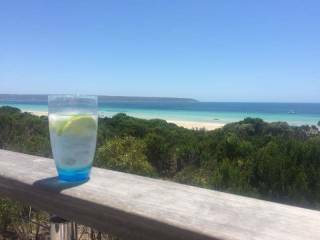 Set on 50 acres of southern ocean scrub with the wild Pennington Bay Ocean roaring in the background, Allure is a unique, private escape from the everyday. You are very welcome to bring your pet dog, too, so they can also enjoy a break away. If privacy, space, peace and romance are what you love and if a chance to experience wild, beautiful, rugged nature is what you adore, then Allure beckons.